Peter Orszag’s maiden voyage as a New York Times columnist resonates with twenty years of failed economic policy. It’s a grab bag of Robert Rubin’s Greatest Hits, remixed by a younger DJ for new audiences. It’s all there: The mythologizing of the markets. The ritualized search for “credibility.” The search for a middle ground position, where the “middle” is defined by investors and not by voters. And a continuation of tax policies that favor Wall Street and the wealthy. As a bonus track, we even get the same old Social Security shuffle. Orszag proposes to extend the Bush tax cuts for two years, for the wealthy as well as the middle class, and then end them for everybody. His proposal would continue to transfer wealth upward, then freeze everyone in place. That’s a bad idea in principle, and it’s based on the same sort of blue-sky assumptions about jobs that got us where we are today. Orszag begins by discussing a “nasty dual deficit problem: a painful jobs deficit in the near term and an unsustainable budget deficit over the medium and long term.” The phrase “in the near term” illustrates the flawed assumptions behind this proposal. We’re now facing higher unemployment than was predicted without the stimulus. That miscalculation should have given Orszag pause. With long-term unemployment at 6.2 million and jobs growth lagging behind demographic changes, it’s reckless to assume the jobs “deficit” will be much better in two years. And if you really want to create jobs, there are a lot better ways to spend billions of dollars than by extending tax breaks for the wealthy. Orszag counters that this is the only kind of deal that could pass Congress. But is that true? Remember, all the tax cuts are due to expire. Would Congress really vote down a bill to extend middle class tax cuts? One doubts that the New York Times hired Orszag for his skills as a political prognosticator, so why is he suddenly defining the limits of the politically possible? One good guess is that he has an ulterior motive: This short-term “compromise” is the best way to eliminate all tax cuts in the name of deficit reduction. That would be a Faustian bargain. It would transfer billions to hedge fund managers and other wealthy Americans in the short term, while adding an equal amount to the deficit – all in the hope that in 2013 whoever is President will be able to do what Orszag argues can’t be done now. If you’re confused, don’t worry: The problem isn’t you. There are a number of reasons for this disparity. One reason is that the cuts limit taxes on capital gains and dividends to 15%, as opposed to the higher taxes paid by cops or teachers. Capital gains will be taxed at 20% if the cuts expire, while dividends would be taxed at each filer’s regular rate (up to 39%). There’s a counter-argument to be made here: If the tax cuts disproportionately benefit the wealthy, why shouldn’t they be allowed to expire the way Orszag proposes? Perhaps they should, at the right time. But Orszag’s solution raises more problems than it solves. 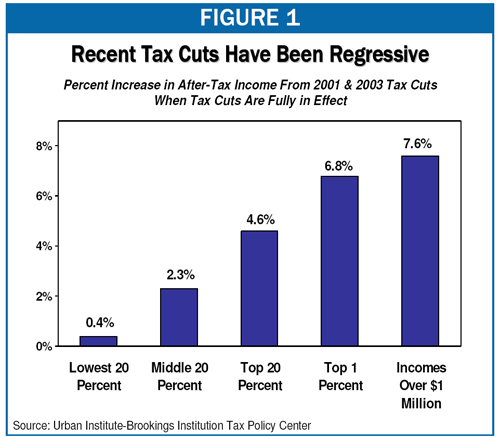 It extends the ongoing aggregation of wealth by the country’s highest earners, deprives the government of revenue that’s needed for job creation, and extends the current inequities — all in the belief that the nation’s leaders will honor the bargain by letting the cuts expire in 2013. The President’s solution would offset some of the inequities created by the past years’ cuts while directing future breaks toward those who are most likely to spend the money. Many observers are expressing surprise at Orszag’s position. They shouldn’t. This is a deficit hawk’s tax hike, consistent with a wide array of proposals designed to reduce the deficit at the expense of the middle class. Orszag’s deficit-hawk history goes back to his tenure at Rubin’s “Hamilton Project,” a division of the Brookings Institution named for Alexander Hamilton. Hamilton was the nation’s first advocate for paying down the national debt and using central banks to promote commerce, which should give you an idea where they’re coming from. (Is somebody planning to fund a “Jefferson Project”?) The Hamilton Project’s Advisory Board is heavily weighted with investment bankers and other power players (Goldman Sachs, Carlyle Group, BlackRock, etc. ), and the group earned some notoriety for its proposal to privatize unemployment insurance. It became a home for Clinton’s deregulation-prone economic advisors, and Orszag polished his deficit-hawk arguments while he was there. Consider the paper Orszag co-authored with Rubin and Allen Sinai in 2004, entitled “Sustained Budget Deficits: Longer-Run US Economic Performance and the Risk of Financial and Fiscal Disarray.” (pdf) It argues that deficits must be cut because traders, investors, and creditors will become fearful of high inflation caused by government spending, because credit markets will clamp down on government debt, and because government spending will be a major contributor to loss of business and consumer confidence. Bear in mind that these words were written in 2004. And yet, despite an exploding deficit and the worldwide economic collapse caused by policies that Rubin et al. espoused, none of those things has happened – not for the reasons they gave. How does Orszag address this awkward reality? He doesn’t. Instead Orszag mentions today’s “benign bond market” (make that “ebullient” or “enthusiastic“), saying it’s “a luxury we won’t enjoy forever.” The Rubinomics view of markets: When they agree with us they must be placated. But when they don’t, ignore them. They’ll see things our way eventually. Orszag, like Rubin and the other DLC types that created this mess, still has his eye on Social Security too. He writes: “Even if we reform Social Security, which we should, any plausible plan would phase in benefit changes to avoid harming current beneficiaries.” Read that sentence carefully: He wants to “reform” Social Security, but his “reform” won’t help the short-term deficit because it will only “harm” (his word) future beneficiaries. That positions still rules Washington … and the Deficit Commission. Orszag’s anti-Social Security stance is the mirror image of his tax position. Both reflect the Rubinite premise that financial security for the middle class is a luxury we can no longer afford. It also reflects the misstatement of Social Security’s finances in the 2004 Orszag/Rubin paper: “… as the baby boomers increasingly reach retirement age and claim Social Security and Medicare benefits, government deficits and debt are likely to grow even more sharply.” (Wrong: Social Security is separately funded.) And it’s consistent with the benefit-slashing policies Orszag proposed in a 2005 Hamilton Project paper he co-authored with Peter Diamond, modestly called “Saving Social Security: The Diamond-Orszag Plan.” That plan included phased-in cuts that would reach 9% of benefits, along with tax hikes for everybody. In other words, more cost-shifting onto the middle class. On the other hand, Gibbs appeared to underscore the President’s strong disagreement with Orszag, which hopefully undercuts the troubling possibility that Orszag’s column is a trial balloon of some kind. But it’s hard not to worry. A number of Senate Democrats are privately pushing for an Orszag-like Faustian bargain, and Orszag has demonstrated an enormous ability to influence the President in the past. Let’s hope there’s no more to Orszag’s column than meets the eye, and that the reports of an Obama/Orszag rift on this issue are right. Otherwise, Orszag may be preparing the country for another disastrous bargain – just when we can afford it least. The President should stick to his guns. This post was produced as part of the Curbing Wall Street project. Richard also blogs at A Night Light.